The pre-owned two wheeler’s market in India is increasingly gaining popularity and the outlook ahead seems bright with media reports suggesting a significant rise in sales by the year 2020. 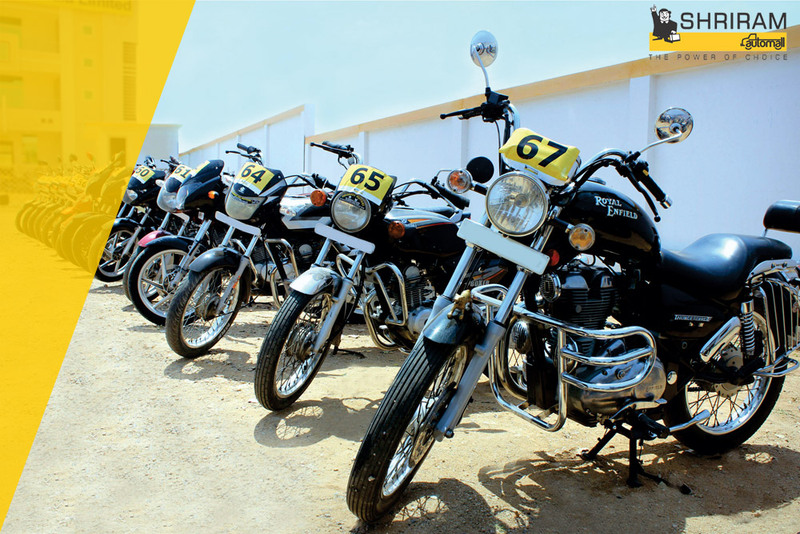 The predictions haven’t gone unnoticed by the market players and thus, the industry can expect the entry of multiple new brands investing in the two wheelers segment in the near future. Although, this is good news for buyers in terms of having a wider frame to choose from, it isn’t going to be exactly easy for the fresh players entering the zone because of the thriving competition. They will need to make their presence felt strongly and engage with the target audience adequately to give better solutions after gaining understanding of their specific pain points. They will need to develop an outstanding recall value well to make their mark and get ahead of the competition. The existing dealers for the used two-wheelers will also be gearing up to take strategic advantage of this changing economic condition by catering the best of the value added services to their customers and also providing improved second-hand vehicles to give a thrust to their individual sales. However, both the new as well as existing players will get serious competition from the online portals, which usually offer great deals and the ease of purchase to the customers. Thereafter, many dealers may actually enter into a tie-up with some of the recognized online portals to promote their sales figures and capture the market at large. The growth of the two wheeler sector is primarily driven by the increasingly tough traffic conditions on roads but also because of the immense variety available with frequent launches of varied make and models. Though, we live in a scenario where customer preferences are often class conscious but practicality demands the feasible option of two wheelers as a necessity considering the rising pollution levels, traffic jams, lack of parking space and the increasing road rage of getting your expensive hot wheels bumped. All this accounts for a major rise in the used two wheelers sales with customers going after the more realistic alternatives for their day to day convenience. While looking for the purchase of pre-owned two-wheelers, the most trustworthy name which strikes instantly is that of Shriram Automall. It pioneers as a service provider for the exchange of used vehicles and equipment through varied transparent and professionally organized platforms. It serves as your one stop solution for buying and selling of used vehicles and equipment in a systematic and fair manner. In case you or an acquaintance is on the lookout to purchase or dispose any kind of used vehicles in India, simply submityour requirement and get a quick call back from Shriram Automall to assist you further. 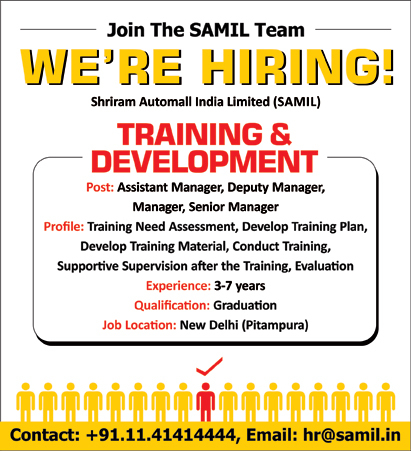 #ShriramAutomall India Limited (SAMIL) has the multiple job openings for the following profiles. If you think you have the passion for and can match up to the requirements of the positions given herein, please get in touch with us at the contact number/ email id as mentioned. As they say, there’s always a first time for everything and which often proves to be a rather tricky for the first timer. When doing anything for the very first time, there are some hesitations as well as confusions and one is also faced many uncertainties as it is something which you haven’t done for real ever before, even though you might be knowing enough about it through varied sources. Similarly, buying a car for the first time can be rather tricky for an individual and specially, when you have decided to invest in a pre-owned car. It is also another thing that whether to buy a new or a used vehicles is another dilemma altogether in its own. While there may be definite advantages of going for a brand new vehicle, it certainly doesn’t fit every bill; for some, buying a pre-owned vehicle can prove to be better call while for others, they can’t even afford to get hands a new one and so, a secondhand one is the only option. There are numerous benefits of buying a pre-owned vehicle, being affordable and much cheaper in comparison to the new one being the primary reason. These days, the market is flooded with a humongous collection of all makes and models available in the pre-owned segment and one is spoilt for choice. Moreover, there are a variety of options available for every individual with a different money range, so as to suit the pocket of one and all. Thus, if one can buy the same car, same make and model, at a higher price as well as lower price, barring the quality and model year. 1. Research- Ample research is the key to cracking a sure shot deal, be it from the internet or through certain personal sources, it is important to know all the details as well as technicalities well in advance. Knowing your market, the prevailing trends and prices helps a lot in making a sound judgment. 2. Keep your Options- Variety is the spice of life, is often said by many; it definitely holds true as keeping your options open and then choosing sensibly and calmly from amongst them is better than just going directly for the first and later, regretting on seeing other options. Make yourself rest assured that you are taking the right call and not one in haste. 3. Multiple Trials- It is extremely vital to take a proper trial of the vehicle before buying and go into all the essential details, not only by yourself but also doing the second visit with an expert of your trust and not related to the seller. This way you can be sure of an honest and sound opinion with you. 4. Suitable Pricing- Ensure that you quote a final price only after discussion with an expert, a knowledgeable friend or acquaintance and not just randomly. It often happens that a good deal goes away because of random price quotations given earlier and then backing out later for a lower cost. Not only you come across as confused and not sincere to the dealer but also make the process rather tedious. Keeping these vital pointers in mind while making your first time purchase of a pre-owned vehicle is highly advisable for attaining better results. So, get set go and make that desirable and otherwise unaffordable car yours today! In case you or an acquaintance is on the lookout for buying or selling of pre-owned vehicles and equipment, you have reached the right platform, a one stop solution to address all your similar requirements. Shriram Automall is a pioneer in providing a magnificent variety of pre-owned vehicles and equipments for years now, the trusted name customers rely on. 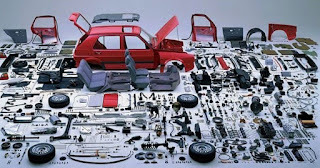 The Indian Auto after-market, though a secondary market of the automotive industry primarily related to the varied functionalities of all the vehicle parts and accessories after the sale of the automobile, stands equally important to the automotive industry. The after-market forms the basis of the auto industry as a whole and as per the latest media reports, it is expected to enter into the double-digit growth curve in the near future after its negative state of no growth in the past couple of years. The industry data suggests that while presently the Indian auto after-market, inclusive of all its categories, sizes at approx. USD 7 million dollars, it is expected to achieve a growth of about 10-12 per cent going ahead, provided the anticipated growth rates remain. Now that the scenario is changing fast for the Indian auto market and there is sufficient vehicle populace in the country, these predictions on the after-market growth rates seem acceptable despite the technological changes incurred as well as the less important repair trend in the auto industry. In the past 2-3 years, the utilization levels of vehicles were not adequate so as to drive in progress for the auto after-market and that’s what majorly reasons for the slow to no growth of the industry. Also, with the upcoming changes in the wake of new trends, advanced technology and the rising digital influence, the auto after-market is predicted to be undergoing enormous changes in accordance. Moreover, for the industry to function smoothly, the after-market ecosystem would require support with the technology, investment, OEMs and the auto parts markers to cover the gap created in vehicle servicing. There are numerous players in the industry dealing with the restoration services for the vehicles sold, who will also be witnessing ample progress in the arena corresponding to these latest growth hike reports. Shriram Automall is one such recognized player in the market, which is primarily a service provider of pre-owned vehicles and equipment yet also provides its allied services for repairing, known as ‘Refurbishment by New Look’. The company facilitates refurbishment of pre-ownedvehicles and equipment through an efficient repairing process, providing the best price realization on assets. In case you or your acquaintance is on the lookout for such refurbishment services or are interested with the buying or selling of pre-owned vehicles and equipment, rest assured that you have reached the right platform, a one stop solution to address all your similar requirements. Shriram Automall is a pioneer in providing a magnificent variety of pre-owned vehicles and equipments for years now, the trusted name customers rely on. If you are looking to purchase any kind of used vehicles in India, simply submit your requirement and get a call back from Shriram Automall to assist you further. 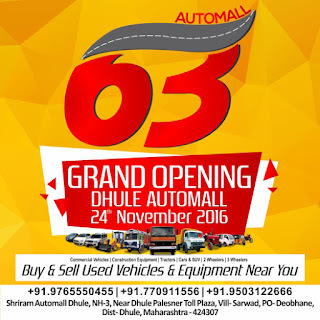 Shriram Automall India Limited (SAMIL), India’s leading service provider for the exchange of used vehicles and equipments will be inaugurating its 63rd Automall in Dhule, Maharashtra on November 24, 2016. The Automall will be SAMIL’s 12th facility in the west zone and will aim to satisfy the demand of pre-owned vehicles and equipments through an organized medium. The Automall is strategically located at the most prime location near Dhule Palesner Toll Plaza, Vill- Sarwad and is spread over a sprawling 7 acres of land. People from all across Dhule and nearby locations like Jalgaon, Malegaon and Bhusawal can conveniently visit the Automall and participate in our thrilling bidding events. Dhule is a state which is witnessing a growing demand for pre-owned vehicles and equipments in the recent past few years; the used agricultural equipment market in particular is the highlight as it has maximum cultivable land and is recognized widely for its production of the purest ‘milk-ghee’. Shriram Automall endeavors to meet the increasing demand of customers in the used vehicles segment through its constant efforts by inaugurating more Automalls in the state. SAMIL, through its agreements with leading banks and NBFCs, will offer the most extensive line up of all segments including commercial vehicles, construction equipments, agricultural equipments, passenger vehicles, two wheelers and three wheelers. The idea is to provide unparalleled service to its customers for all used vehicles and equipments, providing them access to a wide variety at a single place. You are all cordially invited to be a part of the grand inauguration ceremony on November 24, 2016, 10:00 am onwards. Come and join us in our most exciting bidding event and get the opportunity to buy the used vehicles of your choice in a most transparent and organized manner. As part of our expansion plan to inaugurate 75 well structured Automalls by 2020, with the launch of Dhule Automall, which is the 63rd facility of the company, we aim to reach the number well before the set target. With favorable demand of used vehicles and equipments all across the country along with a positive outlook for the coming years, we are hopeful of achieving this new target easily. Our well structured & fair dealing process has been accepted quite well by the customers and we are all set to strengthen their trust yet again through this Automall. Although, the past three years have primarily witnessed a continuing slow down for the Indian construction equipment industry, the situation seems to be on a complete transformation drive now. With the focus of the new government shifting towards increased investment in the development of infrastructure in the country, the construction equipment industry witnesses a corresponding thrust in its sale figures this year. Several stuck-up projects from earlier are now being given a green flag along with some favorable initiatives being taken in terms of refinement of the old confining policies. As per media reports, the first five month period of the year has brought about the good times back for the industry, which has greatly contributed in enhancing the positive sentiment back in the market. The pre-owned construction equipment in particular is too on a rise with the new positive developments in the infrastructure industry. The heightened numbers in terms of infrastructure building has led to the construction business owners reviving their interest in varied used construction equipments for all their requirements. Construction equipments not only make the process easier, quicker and systematized, but also reduce the cost as well as the uncertainty which comes in from dependability on human resources. As these equipments are heavy and are available in varied types for different functions required to be executed for different projects, there is a growing popularity of the second hand construction machinery in the country for it is much more affordable as compared to the new one. We see a drastic change in the people’s perception with regard to new v/s pre-owned. Individuals as well as businesses both are far more realistic and practical these days as opposed to a few years back when the thought of pre-owned was looked down upon and was merely the cup of tea of the less privileged ones. And with the new Government reforms in infrastructure boosting the economy, the market is all set to boom and transform from its state of slump from past three years. In case you or an acquaintance is on the lookout for purchasing any of the usedconstruction equipments and vehicles, you have come to the right place. Shriram Automall India Limited (SAMIL) pioneers as an established service provider in the field. Contact today to get the best deals at the most trustworthy and structured platforms. Speaking about the new age varieties of construction equipments, it wouldn’t be wrong to say that they have entirely changed the way the construction industry works in today’s advanced world as compared to a decade back or so. Let us understand about one such useful apparatus we have. 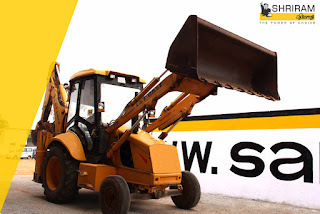 A Backhoe Loader, commonly known as a digger in layman terms, is earthmoving equipment that comprises of a tractor like unit installed with a loader-style bucket sort of component on its front and a backhoe on its back. It is one of the highly beneficial and frequently employed tools within the urban construction projects, particularly owing to its comparatively compact size and shape than the other equipments available in the market. And again, owing to its easily manageable built, it’s considered to be among the most performance oriented construction equipments. The new initiatives such as the recent Government sponsored rural employment actions are becoming a major challenge in procuring enough manual laborers for construction projects. Moreover, the globalization is taking place at a much faster pace and there are a plenty of projects operating at a huge level. Equipments serve with an unmatchable speed and thus, reduce the cost factor in the long run. The shape, size and overall design of a backhoe loader is made to be very efficient, environment-friendly and suitable for multiple tasks together to enhance its demand even more in the construction segment. 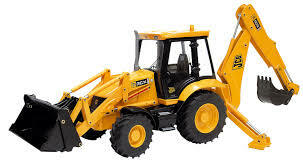 Backhoe loader is the construction equipment which makes using it highly convenient in most of the cases, thanks to its simple, small shape and multiple functionalities which can be conducted easily with the help of several attachments available such as a grapple, auger, grinder or breaker. The backhoe and loader are separate components and have different applications; they can be used independent of each other. A backhoe is primarily required for digging, mining and breaking while the loader, as the name suggests, remains confined to loading alone, for filling the carriers which in turn shift the materials from one place to another. It is profoundly employed at a number of places such as construction sites, civil construction sites, mining, digging/excavation, small demolitions, minimal transportation of the construction materials, assisting the other building equipments, landscaping and paving roads etc. In case you are on the lookout for pocket-friendly yet high quality pre-owned construction equipment range, please feel free to get in touch with Shriram Automall India Limited (SAMIL) and get your hands on the best of used vehicles and equipments available through a unique and advantageous bidding platform. 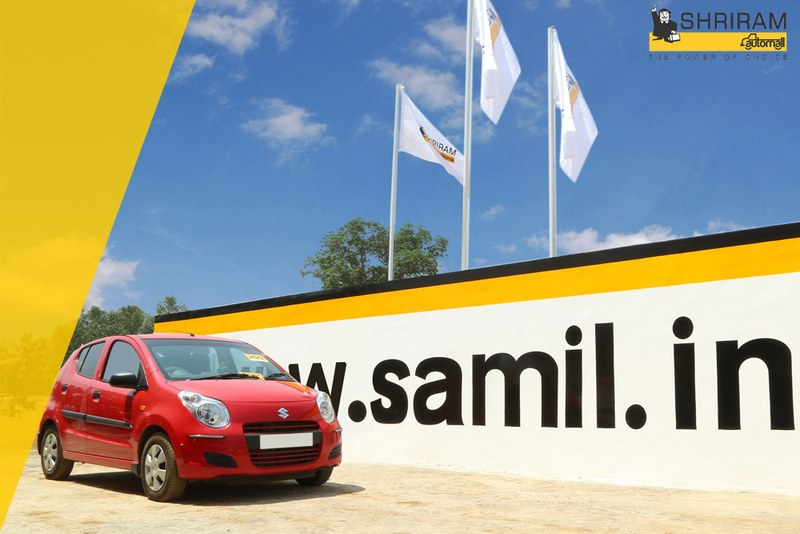 SAMIL is a pioneer in providing a magnificent variety of pre-owned vehicles and equipments for years now. One is often found contemplating hard when it comes to buying a vehicle for personal use or otherwise for the market is flooded with all kinds of varieties today. If we talk about the automobile industry, particularly the passenger cars and two wheeler vehicles, used vehicles were looked down upon almost a decade back. People had always related used vehicles as cheap and worthless investment as they were never expected to perform in the slightest. Interestingly, the scenario has completely turned topsy-turvy with the current times witnessing greatly enhanced popularity for the used vehicles segment. Considering the latest reports surfacing, it may not be entirely incorrect to say that the growth of used vehicles market may now even be an alarming call to the firmly established new vehicles industry. Undoubtedly, the highlight of the used vehicles segment has to be its wide range of options available today at highly reasonable prices. This power of choice being catered to the masses at such competitive prices is what has attracted increasing number of individuals to consider going for a high-end used vehicle as opposed to a mid-level new one. While this certainly comes to fulfilling that much deep-rooted aspiration for luxury in the general public given our brand-ruled environs today, the sort of quality and experience it offers along is a cherry on the cake for society’s middle-class section. In addition to the cost factor, there are several different problems being faced by the people today, biggest one of them being of parking your vehicle anywhere and everywhere at ease. This lack of space availability results in vehicles being stuffed together in a rather compact area, often leading to ugly scratches and dents in all vehicles. Thus, preference for used vehicles gets further enhanced. Discussing about the vehicles segment, we almost unfailingly mention about the middle class alone and simply forget to associate the higher class people with it. This is not the case anymore for even the classes are considering used vehicles as their second or even third alternative vehicles either for menial jobs carried through their employees or merely as contingency vehicles. These changes in lifestyles, surroundings, thinking as well as the improved quality and prices of the used vehicles together contributes towards heightened appeal for pre-owned vehicles now. Either you belong to the middle class segment or the higher class, if you wish to purchase any pre-owned vehicles or construction equipments (if in business), you have reached just the right place. Your search ends here at Shriram Automall India Limited (SAMIL) with its wide array of used vehicles there for its customers to freely review and then bid for the same in its professional auction events. The latest declaration made by the Hon’ble Prime Minister, Shri Narendra Modi, regarding the cancellation of 500 & 1000 rupee notes has taken all by surprise. Though, the action is targeted towards resolving the critical issue of black money and for the betterment of our economy, it is also posing some obstacles to the common people and businesses. 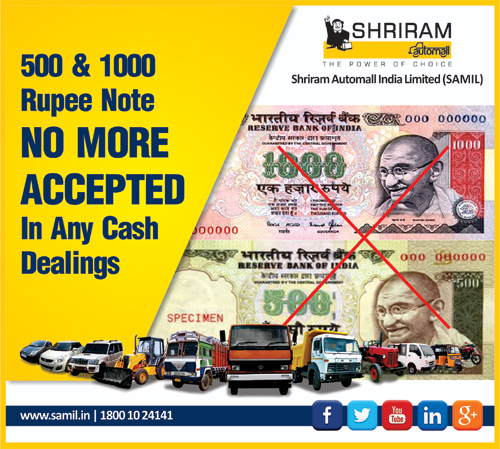 As per the RBI guidelines, Shriram Automall will not be accepting 500 & 1000 rupee current denomination old notes with effect from November 09, 2016 for any cash dealings within the Automall or otherwise for any purposes. Owing to this, all cash dealings at the bidding events being held at different locations around the country were affected to a great extent, where the non-acceptance of the 500 & 1000 rupee notes and the limited valid denomination available both led to disruption in the flow of registration and bidding activities. It made it difficult for the Automall managers to handle the crowd coming to them with now old currency notes and approaching for purchase. They had to refuse many, leading to slowed down transactions and also, disappointment to the customers. Though, we made a provision for accepting cheque in place of cash for a certain amount of money for our prime customers who have been regular and loyal to us for years. The team at Shriram always puts in its best efforts to ensure that the current situation should not let its customers being affected to the maximum extent possible. The company regards its customers with utmost priority and thus, its quick and easy alternatives came into handy play to enable instant access through online transactions by using SAMIL mobile application and website payment gateway as well as via card transactions. 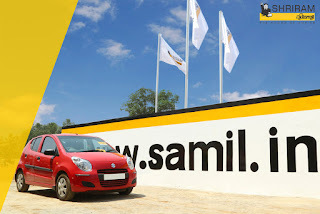 SAMIL executives too are working hard in their own capacity towards ensuring an unhindered dealing, providing complete support at every step and educating those in particular who are technically at the back front so as to enjoy a hassle-free experience at all our Automalls. Rising Sales for Used Vehicles- Festive Season’s ample contribution to thank!! Festive shine was seen all across the country with recent Diwali celebrations in October, gone by in full swing everywhere. Enthusiasm measures were as high as 10 on a scale of 1-10 for almost every sector and undoubtedly, all business industries experienced a visible thrust. While in the automobile industry new vehicles enjoyed the enhancing sale numbers by the hour, as per usual, it is the used vehicles segment which seems to have made a mark with its numbers this time. Where people in India, mostly religion-oriented, prefer following the traditional norm of buying something new on a festival, the rise in used vehicles at this celebratory time is unusual and paints a promising picture for the industry. In particular for the used passenger cars and two-wheeler vehicles, the ascending sales have been noticeably higher than ever in the month of October. As per media reports, the pre-owned car sales are experiencing a 15%-20% year-on-year increase with an overall 30% increase for the entire car retail segment. Big giants dealing in both new as well as usedcar vehicles have expressed their delight on the growing enhancement in the used vehicles sale. This considerable sale hike has baffled even the top players in the industry with the sizeable lower-middle class customer base going in for the reasonably priced pre-owned vehicles as opposed to the new ones. Interestingly, these heightened sales have caught the attention of the online e-commerce space as well with even the top sites such as Amazon focusing more on the car accessories and other automobile parts for catering to the throng of customers. All these drastic developments are rare yet a very pleasing indication for the future of all the pre-owned industry operators. As per the analysts, the used vehicles segment in the country is at a flourishing stage and is expected to grow up the ladder with an exceptional rate in years to follow. It seems all the merry-making of the occasion and the approaching year-end has indeed ignited many customers and also the transport-based businesses to invest in lucrative pre-owned automobiles. Hailed as one of the most significant economic reforms since India's independence, the Goods and Services Tax (GST) is a potential game-changer for the economy. While the legislation is yet to sail through the choppy waters of centre-state relations, its wide-ranging implications for a host of sectors are already under the scrutiny of the media and the commentariat. Given the pivotal space the automobile sector occupies in the Indian industry universe, it's natural that the GST's impact on it will have reverberations across the economy as a whole. Seeing the media reports surfacing in the recent past, one can easily judge the GST to be one of the most phenomenal changes sharply impacting the Indian economy. GST is another type of indirect tax such as VAT and others but one that endeavors to bring the much needed tax uniformity in a developing nation like India. When the GST bill becomes active, reportedly in April, 2017, it is going to put together all the direct as well as indirect taxes levied currently into one flat consolidated tax to be applied evenly across the nation. Its impact on India's automobile industry will certainly be evident for it will entirely change the industry's price scenario. As per media reports, the implication of GST is to result in a considerable 10% reduction in the prices of small car segment while a mere 2% for that of the SUVs and other luxury cars. This is supposedly to be the outcome of a flat tax rate application of 18-20% for the cars under 4-meter and that of 40% for the ones over 4-meter. This is opposed to the current differential figures of 12.5% excise duty for small cars, 24% for mid cars, 27% for luxury cars and 30% for the SUVs. While GST brings home great news for the small car segment and the new car buyers alike resulting from a significant drop in prices, the used car market is bound to suffer the impact of this plausible rise in the sales of new car market. Buyers will then be supposedly more inclined in the purchase of new cars, thus, flooding the used car market with relatively much less demand for them. This surplus supply of used car is to put dealers in a difficult situation of offering much lower prices for the used cars, resulting in losses overall. Consequentially, the resale value of cars is expected to go down by a good 10-15% owing to a highly competitive environment due to the high sale of new cars and increased pushing in of the used cars in the market. Thus, while the post-GST era will see a flourishing time for the purchase of both new and used cars, it isn't going to benefit the sellers of used cars in any way. This imbalance in the car prices that will be created post the implementation of the GST will have a vital impact on the automotive industry as well as the equipment industry as a whole. Where the new car segment will abruptly witness higher demand which can in turn will positively effect the auto equipment market but can also drastically put immense pressure on the equipment dealers which may even result in diminished quality. Also, the same debate of an adverse impact on roads and traffic as at the time of launch of Tata's Nano still holds true with a great number of two-wheeler segment expectedly shifting course to small cars. As for the automotive and all the other major sectors of the economy, any drastic change brings in its own share of benefits as well as challenges for one and all from time to time. No set of predictions and preparations can put away the necessary rigid and pivotal consequences it can create in the long run. And yet there are major concerns to the final activation of the GST bill and more on its appropriate and uniform implementation in the entire economy alike. 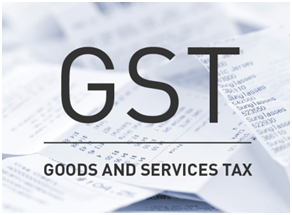 While the GST may have certain poignant aspects, eventually it all boils down to the manner in which it is applied and accepted in the market by both dealers and buyers in their capacity for it to become more of success, good news for the market. If you are looking to purchase or dispose any kind of used vehicles in India, simply submit your requirement and get a call back from Shriram Automall to assist you further. Providing customer with a myriad of options to meet his needs at single place is how the Shriram Automalls’ Kiosks Work. 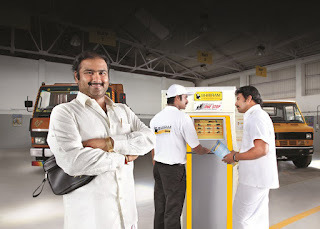 OneStop Kiosk is one such unique technology owned by Shriram Automall for its customer convenience. It is basically a standalone unit through which customers can look for the vehicles they want. It can be easily managed by the users, to get the desired results and informative interface makes these kiosks an instant attraction. Highly interactive, a kiosk does not need any management interference but customer support for the ease in transactions. 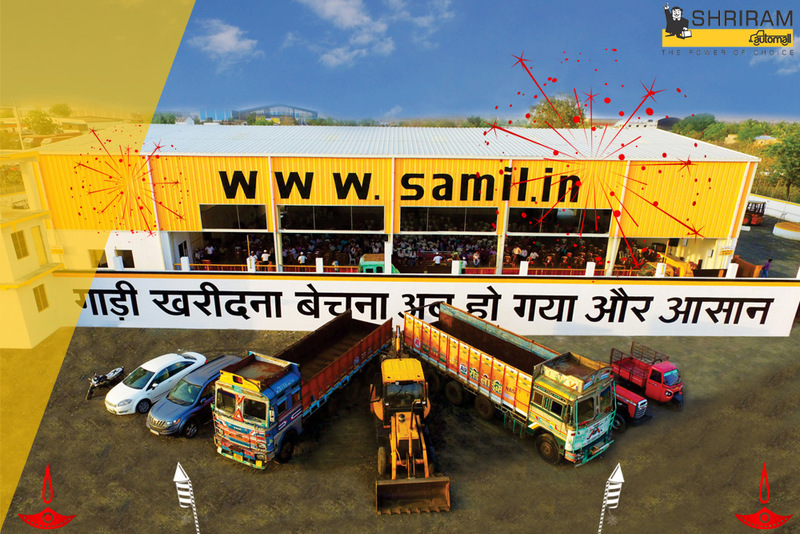 Hassle free services provided by SAMIL, has made us the pioneer in used vehicles & equipment industry, making it the only such company to provide unique platforms for transactions. Not only this, but SAMIL provides the customers with another unique bidding platforms. Customers can acquire or dispose off, cars, construction equipments, commercial and non commercial vehicles easily with SAMIL. Physical as well as online bidding platforms provided by SAMIL enable the customers to own the vehicle of their choice easily. At SAMIL, we connect with people and help them to move forward by providing them with our unique services. SAMIL’s OneStop Kiosks provides a single platform from where they can easily look for the vehicle of their choice from our virtual inventory of over 10,000+ vehicles. Our virtual inventory is always updated with the vehicles that are available with the company and provides a wide choice of variety to the buyers to choose from. Since its inception in 2011, SAMIL’s main aim has been to provide the customers with the exclusive features, so as to connect with customers to help them realize their dreams. We have marked our presence with OneStop Intranet Kiosks at more than 400 locations that are easily accessible to our prospective buyers. Ease in decision making process with Intranet Kiosks, gives buyers the wonderful experience which makes them loyal to us. Logging in to www.samil.in, you can find the one stop service information on the website. · A bidder can check out the inventory list at one stop classified kiosk with the assistance of SAMIL’s executives at an Automall. Using the Kiosk is a very easy task which makes customers preferring the Intranet Kiosks over other options. · Once the bidder decides to acquire a pre-owned vehicle through the Kiosk, he/she can get the registration done by filling up a registration form paying Rs. 100 as registration fees. · Post registration, the customer is given a User ID and Password. That helps him/her to access the Kiosk and further inspect the vehicle in detail. Inspection of vehicle provides customer with detailed information about the vehicle. · After inspection, a buyer can get in touch with the Automall Manager for further assistance. Automall managers assist the customer at every step to make their journey successful with SAMIL. 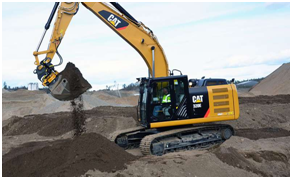 Excavators is one of the extensively used construction equipment today & as a construction business owner you should be well verse of all the available excavator options in the market & which one to choose. 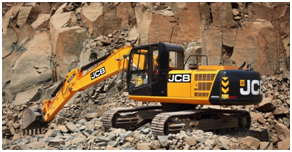 Today we bring you a list of top 5 excavators available. 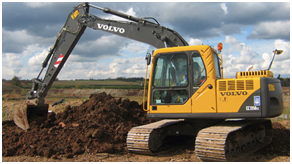 Volvo EC140B Prime – This one is a monster & is designed and built to deliver long-lasting performance, powerful strength and leading fuel efficiency. 21.25 T Tracked Excavator with Cummins 6BT 5.9C engine, 6-cylinder, in-line fuel injection, turbo-charged. 0.8 cu.m. – 1.02 cu. M.
Tata Hitachi EX 200LC – This is one of the most significant players in the mining segment with focus on profitability of customers through high fuel efficiency and low operating costs. Cat 320 EL – Cat 301 7D excavator provides you with good options with good working advantages like more digging depth, power, great reach, more lift capacity & more. As a construction business owner there are situations when there is a need to buy equipment but you cannot afford a new one. 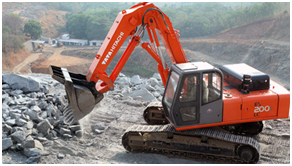 In these situations Shriram Automall is the right choice, the company offers the widest range of excavators in the entire country to choose from at a very competitive price.